You’re probably counting the days down to the start of training camp for the Bills right now. After all, the team ended a 17-year playoff drought in dramatic fashion this past season. Life for Buffalo’s fans can only get better, right? Not necessarily. Let me explain why the Bills had more than their share of good fortune this past season – not even including Andy Dalton’s now-famous touchdown pass to Tyler Boyd in Week 17 – and why it may not repeat itself in 2018. I’ll dig out some information that I’ll try not to make overly nerdy and wonky in spite of the use of history and mathematics. This bit of research started with a fact on ESPN’s crawl shortly after the Bills qualified for the postseason. It pointed out that Buffalo was outscored by 57 points for the season. That was the fifth-highest such number of any playoff team since 1970. Let’s start our analysis with the fact that there is a strong correlation between outscoring opponents during the course of 16 games and having a winning record. In 2017, 15 teams with winning records outscored their opponents, and two teams – playoff-bound Buffalo and Tennessee – were outscored. All 14 teams with losing records came up short in points, so that adds up to 29 correct and two incorrect. Arizona was 8-8 and was outscored. The exceptions come up for a few teams in every sport most years. One of the most interesting cases was the 1987-88 Buffalo Sabres, which finished at 37-32-11 for 85 points despite being outscored, 305-283. At that point, no team in NHL history had ever been outscored by such a large margin and still had a winning record. You probably have heard reasons given for this sort of better-than-expected record, such as great coaching or an ability to win close games with clutch performances. Most analysts, though, prefer to credit something much more simple: luck. A majority of the key bounces can go your way in a given year. Getting back to football, it’s actually not that unusual for an NFL team to squeeze into the playoffs despite having a negative point differential on the season. Three teams did it in 2016 – Miami, Houston and Detroit. A total of 11 teams have done it since 2010. Let’s narrow the range of teams a bit by taking a look at the list of franchises since 1970 that – following the ESPN example – were outscored by at least 50 points in a season and still made the playoffs. “Diff” is a reference to point differential in a season. Of those seven teams, five entered the playoffs through wild-card berths. The 2011 Broncos and 2010 Seahawks won divisional championships, which can happen with an entire division is filled with teams that are mediocre or worse. It’s not surprising they top the list. Now for something completely unexpected. Out of those seven teams, how many of them won their first playoff game? The answer is six. Only the Bills were eliminated in the wild-card round of the postseason. Everyone else’s good luck lasted for another week. Let’s return to the subject of luck for a moment. There usually is an easy way to determine which teams are the dominating ones in a given season. They are the ones that have a great record in one-sided games. For the most part, their record in close games is less impressive. In 2017, top seeds New England and Philadelphia both went 4-2 in games decided by seven points or fewer, and 9-1 in games decided by more than seven points. That’s rather typical. In 2017, the 9-7 Bills played seven games that were decided by seven points or fewer – and went 5-2 in them. (That puts them at 4-5 in all other games.) Stretching that out a bit, they were 8-2 in games decided by 10 points or less. Their only win by more than 10 points was the 34-14 victory over the Raiders on Oct. 29. Buffalo wasn’t so fortunate in one-sided games. The Bills went 1-4 in games decided by 20 points or more, and 0-2 in games decided by 30 points or more. They lost more games by at least 30 points than the other 11 playoff teams did combined. Tennessee lost one such game as the postseason qualifiers went 7-1 in such contests (the Rams were 4-0). Tennessee was the only other playoff team to have a losing record in games decided by 20 points or more. The Titans went 1-2. The 11 other playoff teams – including Tennessee – went a combined 32-5 in such games, led by New England (5-0), Los Angeles Rams (5-0), Philadelphia (5-0), Jacksonville (6-1) and New Orleans (4-0). 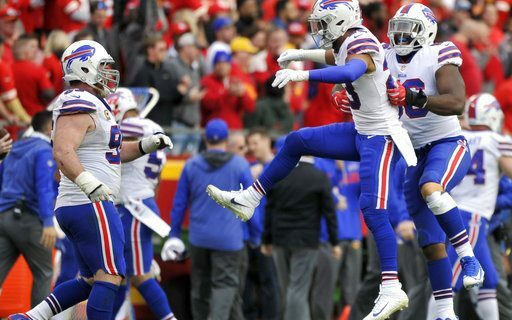 Did the Bills’ season match the profile of the other playoff teams? You’d have to say no. Now we come to the relevant question when it comes to looking ahead. How did those teams that were “lucky” to make the playoffs in a given year do a year later? Did the playoff spots spur them to greater heights a year later? The number of wins by the six teams went from 50 to 37. The Seahawks improved their point differential by 103 points in a year, yet had the same record. Pittsburgh’s number went up by 113 points, and the Steelers’ 9-7 record went unchanged. The Rams improved their point differential by seven points and lost two games in the standings. Denver, Arizona and Atlanta had crash landings. Clearly there could be any number of other factors influencing the records. But the six-for-six performance is a sign that overachieving teams in one season often are less fortunate a year later. I could go over a much larger list of teams and get a similar – if not unanimous – result. The breaks tend to even out. I don’t want to argue here that history equals destiny. Bills’ fans have all sorts of good reasons for optimism, what with a front office and coaching staff that has shown several signs of competence and some extra draft choices that could be useful in adding to the level of talent on the roster. Even so, don’t assume that the Bills are sure to have a better record this fall. They could have a better team and still miss the playoffs. Lady Luck might see to that.